Our long-time friend and collaborator, R.T. Leuchtkafer, has put together a single document that organizes and presents years of data-driven research (academic, government, and industry) of the adverse effects of high frequency trading on markets. This undertaking is mammoth, and it includes press, op-eds, key commentary, books, and documentaries. It is organized. It has sections that you will be immediately drawn to, such as effects of HFT on market quality and investor costs. This is such a key and handy reference for all of you, especially in an age in which HFT firms have grown in mammoth ways, and have become an ingrained part of the liquidity you contribute to, as well as consume. It is a 98 page PDF, so please be sure to download it locally. We attach it to this email, as well as provide you with a short term link from which you should be able to download the document. There are clickable links to individual studies, and we will be passing this on to the Securities and Exchange Commission as well. R.T Leuchtkafer (RTL) has written countless SEC Comment letters on market quality issues, ranging from stock exchange rules and behavior, to applications for protected stock exchange status for new entrants (IEX). He has also written a substantial number of editorials to major financial media outlets, including the Financial Times. 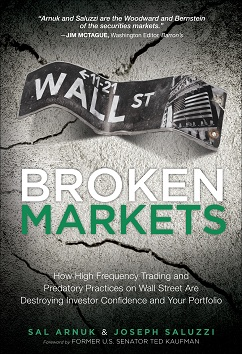 Finally he has written a guest chapter in our book Broken Markets focusing on the May 6th Flash Crash. RTL’s insider knowledge of our industry is immense as well as indisputable, despite the fact that he uses a nom de plume. One day Joe and I are hopeful we will break bread with him, and personally extend our gratitude to him for his role in protecting long term investors. Here is the link to R.T. Leuchtkafer’s 2019 HFT Bibliography.